Having just returned from Russia, I’ve been thinking a lot about public and private space. The country has been experiencing rapid privatization since the early 1990s. Many aspects of urban life, from transportation to housing to recreation, are becoming less public. This isn’t necessarily a bad thing. Private space can encourage responsibility for quality maintenance. We’re usually more likely to repair and improve upon places we own than places we share with everyone. According to the logic of privatization, public maintenance is best contracted to independent businesses. In a way this makes sense. It provides incentive for efficient work, and as long as high quality is a requirement, we should get intended results at lower costs. So why do market efficiencies often result in low-quality public space? Strip malls, for example, or dilapidated waterfronts. I guess it has to do with our priorities, and how much we’re willing or able to pay. If public space isn’t valued, there will be little incentive for businesses to compete over insufficient funds allocated toward its maintenance. We expect to pay more for higher quality cars and houses. But what about bridges, water, roads, and other public entities? Not that we should pay more than we get in return, but it seems that quality services indicate a well-functioning society. 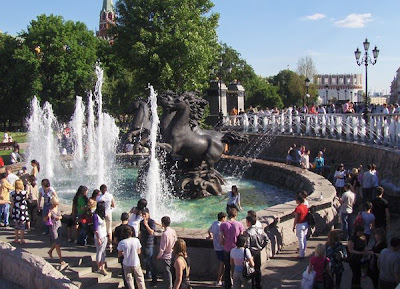 While I found the parks, trains, and streets of Moscow nicely maintained, I heard that some neighborhoods are filled with uncollected garbage, and that the metro system was built at the rest of the country's expense. It's important that the benefits of public investment are distributed fairly. Supporters of privatization might argue that services should be purchased directly by those who benefit from them, so as to reduce the misapplication of public funds. In its most extreme form, this might involve gated communities providing their own infrastructure, tollbooths at every bridge and roadway, and people hiring private companies for protection from crime. This could be considered fair in the sense that services would be more closely related to the amount we pay. However, it is less fair that children from wealthy families should start out with such major advantages over other children in education, health care, and basic safety. While salaries in lower paying fields like teaching and the military might rise with private demand, their services would be controlled by those who could afford them. In looking for ways of maintaining public space, Russia’s experience with socialism could offer useful lessons. While there are many aspects of Soviet rule that didn’t work, there are others that continue to benefit city residents. These include accessible transportation, parks, and cultural resources. It will be interesting to see if Russia can draw selectively from capitalism without losing the advantages of its socialist legacy. At the very least, we can study these advantages and see if they might work in other cities. Is responsible maintenance of public space possible? Working on this would be a sound investment in our quality of life. Of course, the money for public investment has to come from somewhere. This is a question for economists, but it also has to do with where we place our values. If we care enough to improve upon the quality of our surroundings, we can make this happen. It will be important to figure out what improvement would mean and how to go about it. If we make this a priority, things could get better sooner than we think. There's another Whereblogger-authored post up over at Next American City's Daily Report...I'm a little late getting this one up, as it went live over a week ago, but later is better than never, as they say. The post takes a look at three Chicago-based urban planning non-profit orgs' attempts at interactive websites, and their various levels of success at engaging users. Below, a teaser, and here, a link. If you're so inclined, do take a look! In cities—especially densely-populated cities, where open skies are a precious commodity—getting people to use public spaces isn’t usually a challenge. But getting people to talk about public space is another issue altogether. 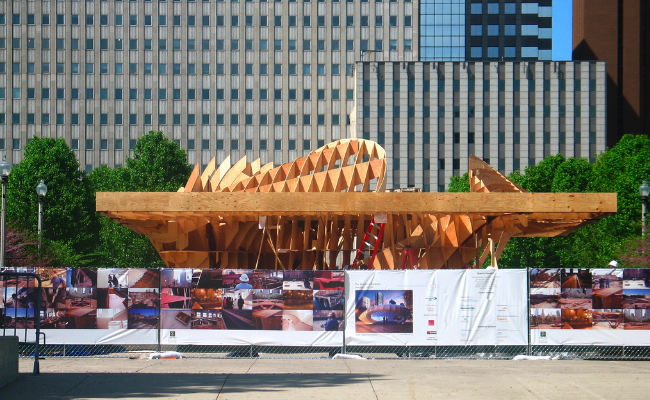 These days, the Internet is allowing planners and architects to reach out to Average Joe citizens to generate discussions about the built environment in new and increasingly creative ways; in Chicago, a number of recent public space-related initiatives have used the web to get people talking about the city’s public realm—with varying degrees of success. Once more with that link. "Participation is war. Any form of participation is already a form of conflict", says architect and activist Markus Miessen, following Chantal Mouffe: "It is very important to envisage the task of democracy in terms of creating the institutions that will allow for conflicts between adversaries." Mouffe, a Belgian political theorist, has theorized on the notion of a "conflictual consensus", in which only a minimum common aim (democracy, equality, justice, etc.) needs to be settled and agreed upon within a society. The means for reaching this aim and even the meaning of the aim itself, on the other hand, can and should be disputable. Miessen is more concerned with the spatial effects and possible materialization of these conflictual consensuses, particularly by way of everyday urbanisms: "When participation becomes conflict, conflict becomes space. Re-inserting friction and differences into both the scale of the institution and the city bears the potential of micro-political forces that render conflict as practice. In this context, participation becomes a form of non-physical, productive violence. Micro-political action can be as effective as traditional state political action." Technologies that enable participation have become a staple of contemporary life, overcoming distance, economic limitations and even political constraints. Teens in Ciudad Neza are glued to their cell-phones just like their counterparts in Midtown Manhattan (though they might be planning a stickup instead of a cocktail soiree). ICTs have become so important to the functioning of societies that mobile phones are being handed out by governments along with food stamps and the One Laptop Per Child project seems demure compared to the aggressive downward pricing spirals of the netbook market. Today, 24/7 global connectivity is closer to practical reality than to some outlandish fiction. From the nineteenth-century barricades to the revolts of 1968 to the social disruptions of the early 1990s, The Street was always an ideal escape valve for urban tensions and the preferred site of high profile (spectacular) political and social demonstrations. The Street was the perfect set for frictions. But if, as we’ve said before, The Street has systematically been loosing relevance, doesn't it make perfect sense that The Web take its place in this sense too? The political perceptions and consequences of The Web and networked urbanisms differ intensely according to specific geographical contexts. Here in Spain — not quite the First World, but still — there is a bubbly enthusiasm over new technologies and the promise of what they might deliver: salvation from impending economic fallout, a new dawn of proactive citizenship, gaining a steadier foothold in the Developed Nations club (after the brick-setter, real-estate-speculator and tour-guide triad has been widely acknowledged to be a flop as far as development schemes go), etc. Lethargic institutions, burned-out public universities, covetous town halls and ailing private companies are all eager to jump on the digital bandwagon here. The government is lending money for laptops, funding mediateques and data centers, talking Citizenship 2.0, etc. Hopes are high and the atmosphere is cheery, but approaches remain largely superficial or are limited to insiders, specialists and bureaucrats. This is not the case in the Third World. My browser is stuffed with Tehran bookmarks. Just like Cuban bloggers sneaking into Havana hotels to post their thoughts and opinions on the web or massive reactions to government corruption cases prompted by unofficial on-line reports in China, web activists and connected common-folk in Iran are opening channels for a new understanding of urban (networked) politics — proving at the same time that networked urban realities are far from being pretty or easy to grasp. The Street (Web) resistance that is shaking Iranian cities along with our reductive and jaundiced perception of Iran (Remember the days when thanks to George W. Bush — and to a lesser degree, Sally Field — Iran rarely evoked something other than a helplessly closed and traditional society?) is one of those events that change people’s gut perception of history in the making. But there is an additional element here. Like the Obama election or the global response to the Swine Flu affair, the unfolding of these fundamentally urban episodes and our reactions to them cannot be separated from the presence of digital technologies. Dharavi II: Does This Look Like a Slum? This is Part Two in a series looking at Dharavi, a mostly informal township in Mumbai often referred to as Asia’s largest slum, and the government’s controversial plans to redevelop it. With billions of dollars on the table, tens of thousands of homes and businesses at stake, and the global spotlight shining bright, this case of contested urban space is worth a deeper look. Dharavi is almost universally branded as a massive “slum.” This terminology is taken for granted in most mainstream media accounts, government designations and the popular imagination. In fact, the planning authority for Dharavi is the state’s Slum Rehabilitation Authority. Even in the legal sense, this term is an inaccurate generalization. According to Sharad Mahajan of MASHAL, an NGO that managed GIS mapping and data collection for the government’s official survey of Dharavi, the 59,316 "slum structures" counted in the survey occupy around 396 of 590 acres. The rest of the area includes government-owned properties (including buildings developed under previous upgrading schemes), a Tata power station, a BEST bus station, Mahim Nature Park, a cemetery, railway facilities, private industrial and residential buildings, and streets (many paved by the municipality). Koliwada, a historical fishing village that existed before Bombay did and ha s historical documents attesting to that, was never a slum — a fact finally recognized by DRP authorities in early 2009, when they agreed to exempt the area from the redevelopment plan. Kumbharwada, a community of potters who migrated to Mumbai after a drought in their native Gujarat, were afforded "Vacant Land Tenure," a unique tenancy arrangement, in Dharavi by the Bombay Municipal Corporation in 1932. There is also the Transit Camp, originally temporary structures built by the government for people displaced by infrastructure projects; decades later, this is a relatively well developed commercial and residential area. Matunga Labor Camp, has housed municipal sweepers for over 50 years. There are also chawls built by the Bombay Municipal Corporation prior to 1940. Many of these areas are now officially labeled slums, which seems legally questionable, even if it is permissible. When you look beneath the surface at the parts considered "slum areas", the term seems equally problematic. Does the ICICI bank on 90 Feet Road count as a slum structure? What about the Sri Siddhi Vinayakar Temple, the 120-year old Dharavi Mosque or St. Anthony Church? Kala Killa, a fort built by order of the Governor of Bombay in 1737? The three-story Gurudutta Gym, h ome to one of Mumbai’s champion bodybuilders? 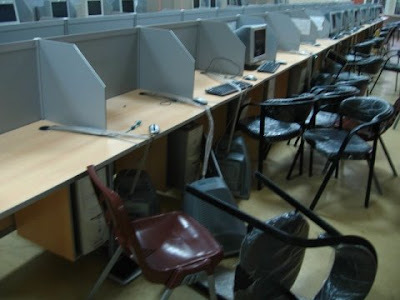 The London-trained cosmotologist’s clinic, blood and X-ray labs, cyber cafes, lawyers’ offices? The air-conditioned stores selling gold jewelry and high-end electronics? The schools, the bakeries who stock stores across the city and 13 Compound, Mumbai’s unofficial but main recycling center? The offices of countless NGOs and associations of every creed and culture? 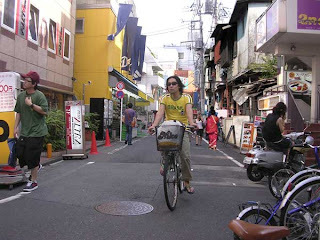 The streets that look like the old city of Jodpur or any small town in India or Tokyo minus a few decades? With more than 80 distinct neighborhoods, over 600,000 people, and a "GDP" of USD 500 million, by all measures this slum looks suspicously like a city of its own. 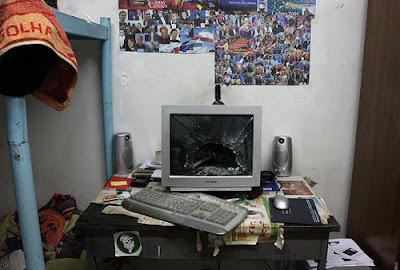 This is not to say that Dharavi is without serious problems. Many parts of Dharavi are overcrowded and suffer the effects of a lack of provision of basic civic services and amenities. Many structures use recycled materials, reflecting owners’ poverty and lack of access to finance. Dharavi needs support to develop. But it should be obvious by now that the label "slum" is inappropriate. "Slum" is not a neutral descriptive term, but a highly affective one. Sometimes – as in the quotes I introduced with – the biases are clearly spe lled out. Even when there are no blatant stereotypes, "slum" is always shorthand for blighted, dirty, dysfunctional, unacceptable. The myth of Dharavi as a uniform slum is reinforced by cliché imagery of sprawling corrugated tin roofs and garbage-choked lanes, repeated on the government’s websites and presentations and most mainstream Indian papers. Rhetoric and images evoking Dharavi’s scale (“largest slum in Asia,” “sprawl of squalor”) further dehumanize it and inflate the “threat.” Middle- and upper-class Mumbaikers have no reason to dispute the term, likely never having set foot in Dharavi. This is not a neutral misunderstanding — packaging Dharavi as one big slum serves a clear purpose. Although there is no single actor behind it, the PR campaign that brands Dharavi as such is so masterful that the inaccurate and loaded term is assumed to be a fact by most and has provided unquestioned justification for the government’s developer-driven redevelopment plan. 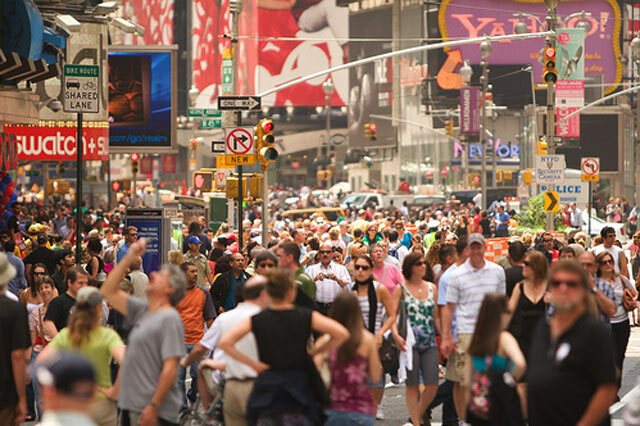 Human navigation is a key component in the organization and form our cities take on. Whether we choose to walk, bike, take public transport, or drive, we are making choices that shape our experience of the city and that will transform the city itself over time. Two great examples of this are taking shape in New York right now: the opening of the High Line park and the pedestrianization of Times Square. Both show how infrastructure and space can be transformed over time based on the alternating use and neglect of transient spaces. As we move forward in a period of increasing transportation curiosity and alternate means of transport, these physical experiments become very relevant and thought-provoking. Everyone is eagerly anticipating billions of dollars for infrastructure investment and reconfiguration, but what kind of infrastructure changes should we really seek? Wider bridges and highways, more bike lanes, light rail, pedestrian access? According to Dmitri Orlov, Russian dachas (cottages outside of cities) helped people make it through the economic upheaval of the 1990s. Apparently, many were able to supplement their diets with food produced on small agricultural plots. Even given long winters, food products could be cured to last until spring. From the air, the landscape surrounding Moscow is different from anything I've ever seen. Instead of almost grid-like plots covering most of the land, there are clustered houses, arranged organically, surrounded by small gardens. 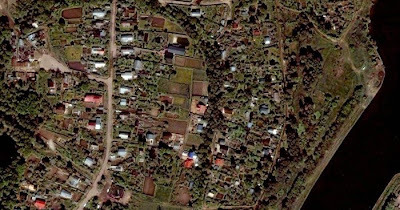 I think these might be dachas (see photo from Google Maps below). On a recent train trip, I saw what I think were dachas more closely. I wonder if it is typical for them to be located near train lines? The majority had small agricultural plots. The countryside was a mix of cottages, forests, and heavy industry. Many of the industrial sites were abandoned. There were a few decaying cottages, but most appeared to be in use. The woman from whom I rent my room is a retired chemist who lives at her dacha year round. So I guess dachas must help many pensioners supplement their incomes by renting out apartments in the city. In our place there are two students and a family of five living in three rooms. Dachas are places for recreation and holidays as well. Their ownership seems less exclusive than summer cottages in the U.S. I'm not sure how they were distributed in the past, but they are very common and apparently not limited to wealthier citizens. A Washington Post article on sprawl surrounding Moscow mentions the possible threat to dachas posed by expanding suburbs. Maybe people will choose these new developments, and small-scale food production will be replaced by giant agribusinesses. 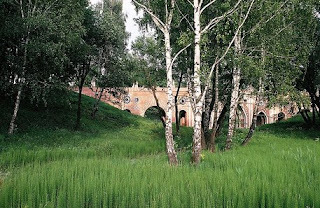 Are dachas to become relics from the past, like some of the industrial sites in the countryside? With today's economic and ecological concerns, small farms could be part of our future. Hopefully this will happen by choice rather than necessity. It would be tough to establish them on private land, and experience with agriculture is increasingly uncommon. But foreclosed or abandoned properties in rural, suburban, and even urban areas might be used. There's no reason we can't learn to produce food. Not everyone will have time for this, and I don't think global agricultural trade should come to a stop. Still, Russia's experience with dachas appears to show that local agriculture can work. 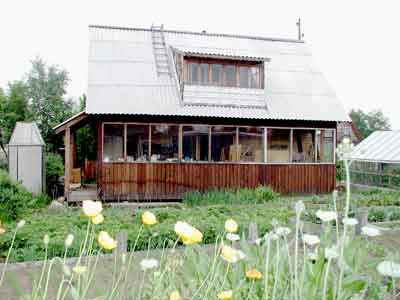 Credits: Photo of a dacha from Vsam1.ru. Aerial photo of the outskirts of Moscow from Google Maps. Whether Mother Earth can cough up the fossil fuels needed to keep the airline industry flying is a matter of debate (and one that we really should be debating). 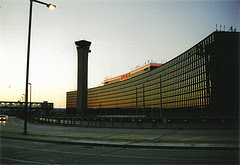 While airports are primarily significant in their relationships with each other, the ground-level impact that an airport can have on a city is massive. John Kasarda has even coined the term “aerotropolis” to describe the economic activity that develops around airports. Unfortunately, urban transportation systems fail to accommodate the aerotropolis. The problem makes sense in light of the transportation challenges that an airport creates for a city. Airports must lie far from the urban core by necessity—a dense urban core actually increases the likelihood that an airport will have to be more remote. Meanwhile, though, successful international airports have spurred the construction of large-scale office parks, hotels, malls and even casinos. In Chicago, the O’Hare area is second only to the Loop in job concentration. Chicago provides a perfect example of the aerotropolis’ accessibility conundrum. An old city with a historically strong center, Chicago now strikes a delicate balance between the transit-oriented past and the automobile-dependent present. In the midst of its shift toward the latter, Chicago happened to build the largest airport in the world (more recently surpassed by Atlanta’s airport). Another half century since O’Hare’s construction, Chicago still has a largely radial transit and road network that both center on the Loop and link the airport to the rest of the city with just a few spokes. Not that Chicago’s planners are to blame for the situation. After all, most of the metropolitan area’s transit infrastructure predates O’Hare, as does much of the city’s residential and commercial development. A hundred years of booming development can’t be reproduced overnight. Furthermore, an airport-generated commercial area still needs to have the actual airport at its center, and airports don’t offer accessible or vibrant public spaces like many downtowns can. An airport is likely to generate a sprawling and automobile-dependent aerotropolis, and to some extent that’s unavoidable. How to integrate the aerotropolis into the metropolis, then? Considering Chicago’s example, a dual-centered metropolis offers an opportunity to create a vibrant and dense corridor between the two hubs. The rail transit network in Chicago, as mentioned above, focuses on the Loop but connects it to O’Hare via the Blue Line. The path between the two offers an easy commute to either employment center and features exciting, walkable neighborhoods and commercial areas that have thrived since before the airport even existed. Thus, the aerotropolis may affect cities negatively in certain ways, but that second central business district might also produce distinct advantages for parts of those cities. When it comes to transition, it seems there is a lot to learn in Moscow. I'm currently writing from there, after a day of walking around and taking a few pictures. The things that really stand out are the lasting marks left on the city from very different governing ideas: ornate metro stations, trees everywhere, aging apartment blocks, modernist masterworks, cars racing down streets that take an incredibly long time to cross. Everything Stalinist is gigantic. Many public works have aged remarkably well. The metro stations are efficient and well maintained. The ones in the center of town have all kinds of architectural touches usually reserved for mansions, theaters, monuments, city halls, and museums. There is a basic sturdiness that prevents them from seeming too extravagant. Public green space lines the streets and fills the insides of apartment blocks. It’s very refreshing on summer days. Parks are full of young couples, new families, and elders reading or just watching people pass by. The ones I’ve seen so far have been clean but not highly manicured, which gives them a kind of wilderness atmosphere. The trains and parks seem like lasting gifts from the past, although they’re surely changing with today’s frenetic market experimentation. The giant streets are much less successful from a pedestrian’s point of view -- like highways running through city neighborhoods. If they were narrowed and filled in with plantings, spacious sidewalks, and small businesses, the improvement for walkers would be significant. I can’t quite see this happening, as the young and wealthy seem to really love these roadways. They're good for drag races at night and 360 skids in the middle of the day. It all makes Moscow an interesting mix of values and ideas, like any city, but multiplied by something extreme. Change? What kind of Change? Yesterday, General Motors filed for bankruptcy and the US Government now owns a 60% stake in the largest American car company. Whether it be for better or worse, one thing is clear: the auto industry will not remain the same, and change is coming. Perhaps now, in the beginning of one of the largest economic restructurings ever, it is an appropriate time to talk about change. There are 2 types of change: regulative change and massive change. One works to bring processes up to date and improve efficiency while the other creates a whole new logic, a whole way of doing things, thereby completely changing the way a system works. GM thought it could save itself by closing plants, streamlining processes, and attempting to create a leaner, more efficient manufacturing company. The problem is, the US automotive industry doesn't just need to be more efficient, it needs to be completely restructured. It is not just the processes that need to change; it's also the motivations, the way of thinking, and the image that drives the company. GM and Ford have resorted to making cartoon cars out of classics! Isn't that post-modernism in a bottle? Is that where we should be? Meanwhile, BMW is making concepts like the GINA which could inspire and rewrite the future of automotive technology. OK, end American Auto Rant. America, and indeed the developed world, doesn't need regulative change, but massive change. Technology has vastly improved the way we communicate and connect with each other and yet we seem to take that at face value and fail to realize how these massive changes could rewrite the ways in which we operate as a society. The vast spread of information provided by the internet allows for and encourages experimentation. In a trying time like this, we should not hang tight to what we know, but venture out into the unknown to explore and grow, like the pilgrims, or like Lewis and Clark. Regulative change is like pioneering a new cassette tape when everyone has an iPod. In our cities, our landscapes, our businesses, and our buildings, we need to start seeing massive change that will bring us as a society up to the level of our technology. The restructuring of GM is an opportunity to create massive change, to rewrite not only an industry but a country, and a mentality. If we want to be in a new age, we have to start acting like we are already there.